We were on the 10 heading West to Malibu by 9AM Saturday morning. 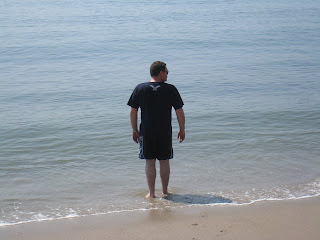 After eating breakfast at Paradise Cove we took a walk down the beach. After about 45 minutes in the sun with no sunscreen I got burned. Good, glad I got that out of the way on day one. We headed North on PCH and checked out all the campgrounds along the way until the freeway veers East away from the coast(naval base) and towards Oxnard. Oh boy. Next stop was north of Goleta at El Capitan and then Gaviota, both full. The 1 is now the 101 until you get to the turn off for Vandenburg AFB/Lompoc and once again you are on the 'scenic tour' route. About 4 miles after the odometer turned 10,000, I got a speeding ticket! In Santa Maria, doing 70 in a 55...and the only spot I could pull over was in an agriculture field of some sort. Needless to say, I was not amused and felt like I was targeted since I was not driving a tractor. If you zoom in on the map while in satellite view, you get the idea. Several miles later and we were in Pismo Beach, which had a very 'spring break with huge trucks and ATVs' vibe. I imagine sales of Coors Light is only threatened by Bud Light being on sale. So we continued north to Morro Bay, which was the polar opposite of Pismo. Since it was about 5:30PM and we hadn't found a campground with any vacancies yet, and Inn on Morro Bay had no vacancies, we headed back to SLO to find a room. 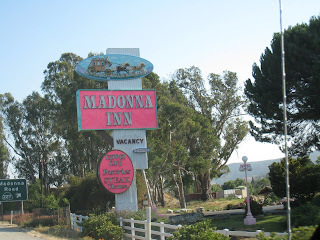 Looks like Madonna Inn has a vacancy! Unfortunately after checking with the front desk, they forgot to turn on the neon "Sorry No" above the Vacancy part on the sign.